Gardening is great for our mental health: there is now significant research evidence that gardening is one of the best, and most accessible, ‘green care’ therapies for supporting and improving mental health. Anyone who looks after their own garden or allotment could have told us that a long time ago but the breakthrough in this research is to show how green therapies can benefit anyone. It Is not just the case that people who like gardening anyway find it a good way to unwind. Of course, the mental health arena is very diverse and even Social and Therapeutic Horticulture encompasses widely differing client groups and practitioners. I have focused my study and subsequent practical work on those with mild to moderate mental health support needs and people at risk of declining mental health, for example from social isolation or dementia. I am not clinically trained to support severe mental health needs but there are great organisations who can help you in this and I may be able to point you in the right direction. I can design and deliver year round gardening programmes for h ospices, residential homes including dementia care, mental health charities and community groups. I can run a pilot of 6 sessions at the end of which we will jointly evaluate the outcomes and you can decide if and how to go ahead with a longer term project. A programme does not need an acre of walled garden, sheds and greenhouses and the therapists or volunteers to go with it. If you have such wonderful facilities, then full advantage can be taken appropriate to the participants’ abilities. But a weekly drop in session, each self-contained, seated at tables and using containers for planting is equally valuable, and is certainly more accessible for many organisations. With experience as an adult tutor I can train staff or volunteers to run a gardening programme in-house and to develop it as time goes by. 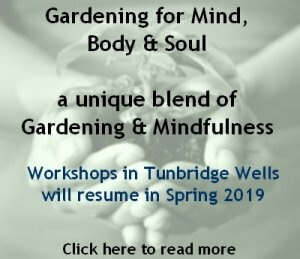 I am currently partnering with a qualified and experienced Mindfulness Facilitator to host “Gardening for the Mind” workshops near Tunbridge Wells. These are a unique blend of the wellbeing benefits of gardening and mindfulness where we explore the process of mindfulness and how gardening can become your everyday activity. Hear us talk about it from the Health Matters Radio Show on Kent Channel Radio. Sign up to the Gardening by Design Newsletter to hear about these and other gardening events, plus seasonal hints and tips. 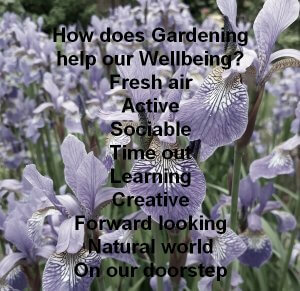 Anyone who knows me will tell you that I just love to talk about gardening and introducing more people to the joys and benefits of this great activity. As well as my general gardening talks I offer an introduction to gardening for mental health that can be tailored in length and content to your particular audience. 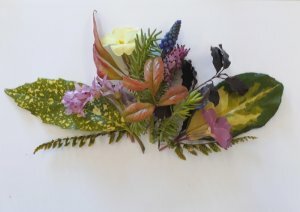 This could make an ideal event to raise awareness or funds for a garden therapy project or school or community garden. In 2017 I tutored short courses for the Kent Adult Education service Community Learning for Mental Health programme called “Learning Well”. This programme was shortlisted for the Tes FE Awards 2018 and on February 23rd I was delighted to be one of the team who attended the awards dinner at the Grosvenor House Hotel in London. See the story here.